As new homes become increasingly smaller, house builders and their interior designers are getting ever more devious, using new ways to create the illusion of space and light in the predominantly small, dark new homes they have to offer. These tricks can influence potential buyers into believing the homes are lighter, larger and more luxurious than they actually are in reality, by creating a superficial "deceptively spacious" first impression. Potential homebuyers should be sceptical when viewing a show home. Don't get taken in by the furnishings and the techniques used. In recent times, some people have become obsessed with lifestyles and developers are using this to their advantage. New homes are small and dark. Below are some of the tricks used by house builders to fool potential buyers. Light-coloured walls. Gone are the days of bold patterned wallpaper statements. Even Accent or Feature walls are out, in favour of light colours often plain white, to create a light, bright and spacious illusion. Doors not fitted. Doors take up room, and close off rooms making them feel smaller. It is therefore easy for the house builders to omit the doors in their show homes, making rooms appear larger and increasing furnishing options as the door swing areas can be used. No fences. Normally the show home complex comprises of a row of different house types. By making the rear garden area one large landscaped space, would be buyers are not able to visualise how small and narrow the actual garden area of each house will be when the fencing is eventually erected. Use of mirrors. Mirrors are an easy way to make a room appear larger and lighter than it is. Some house builders have taken this to extremes, using mirrors in a frame made to look like a window complete with hinges! Lighting. The lights are on but no ones home! Show house lighting is plentiful and always on. This is the only way house builders can try to disguise the lack of natural light available in today’s new homes due to very small windows, or in some rooms no windows at all. Essential furniture is left out. Rooms may only have a bed and bedside table with items such as a chest of drawers or a wardrobe missing, even if there is sufficient space for them! You will also never see a TV in the living room of a show home. Use of scaled-down furniture. Rooms in new homes are sized the bare minimum required for their intended purpose. The use of scaled-down furniture, child size beds, 4ft wide double beds, small sofas and fitted furniture half the normal depth are all designed to give the impression of more space than there will be when you move in with your own furniture. Multi-purpose rooms. It is becoming common to have a kitchen, dining and living all in one open room. 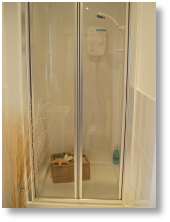 This saves the space (and cost) taken up by walls and doors. 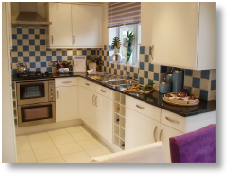 Described by one builder as "a fantastic all-in-one open space that meets all your everyday needs". Use of glass and chrome. Nearly every show home will feature a glass top dining table and plenty of chrome. Anything that reflects light is the builder’s friend as it gives the impression of space. 'Shiny' means new to most people. Carpet uniformity. Using the same plain, light coloured carpets throughout the house to give the impression of space. 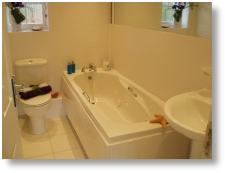 In certain rooms ceramic tiles or laminate may feature, especially if these are available as an optional extra. Luxurious specification. 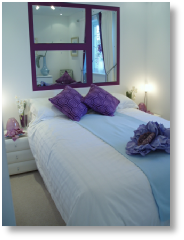 Show homes are nearly always fitted out to higher specification than the actual homes for sale. For example using granite worktops to give that superior luxury look which all too often is available - but only as an optional extra. The heating is set uncomfortably high. This is not done to create a cosy environment, it is intended to prevent potential buyers from lingering too long and noticing the pitfalls and tricks employed by the interior designers. Higher quality of finish. The overall quality of finish of the show house will be much higher than you can expect in any new home you actually buy. Show houses are checked and snagged by several different people and are regularly inspected and redecorated to keep them looking in a pristine condition. Show homes are always in the best locations. The show home complex is usually sited in an open, less dense area of the development. Indeed some of the planned home plots nearby may be grassed over or used for visitor parking until most of the development is sold to maintain the low-density illusion. The Consumer Protection from Unfair Trading Regulations 2008 and the Business Protection from Misleading Marketing Regulations 2008 have largely replaced the Property Misdescriptions Act 1992, making it a criminal offence to make false or misleading statements. 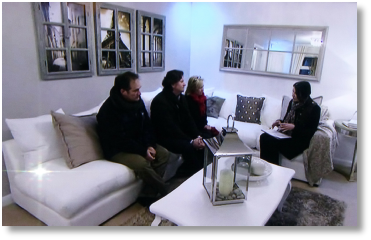 However deception within a show home is a grey area. The more honest house builders do fit notices to highlight "this item is not fitted as standard." But until the Office of Fair Trading use the courts to fully enforce the requirements of these consumer protection regulations, such deception will continue and buyers should realise they are not buying a show home! The cost of the show house and sales centre comes out of the price buyers pay for their new homes. The "new home premium" as it is known includes all the extra costs associated with the show houses. Finally a word of warning, do not be tempted to pinch that bottle of Channel No5 on the bedside table. It is often an empty bottle filled with urine! Also be careful what you say, the show home may be bugged or have CCTV.